The best known self-described anarchist initiative is Anarchists Against the Wall, which is most accurately defined as a direct action affinity group of various left activists, not necessarily anarchists, who oppose the construction of the Apartheid wall and the Israeli occupation. An Anarcha-Queer affinity group called Mashpritzot was recently established and works to promote a more radical view of LGBTQ rights and to break gender dichotomies. Other initiatives and projects have an anarchist influence behind them: various collectives, infoshops, cafes and alternative spaces, some of which have sprung up after the 2011 summer protests. Many in the Israeli radical left are sympathetic to anarchism but are not active. Perhaps they have had no anarchist framework to work inside – our aim is to build this framework. The 2011 summer protests signified a disillusionment with parliamentary politics and political parties, yet the protest movement was unable to move beyond mere demonstrations, and now with the initial momentum behind the protest movement gone, the Israeli left as a whole appears stagnant. Leftists political parties involved in the protest movement expected to benefit and see an influx of new voters, but the effect was not big as the expected and in some cases negligible. In Israel the term ‘left’ has two aspects which are not always connected – the first is an economic approach which promotes some form of ‘social justice’, and the second is a dovish and peace-making approach towards the Israeli-Palestinian conflict. The 2011 summer protests were perhaps leftist in the first economic sense, but not necessarily in the second. Any reference to Israeli-Palestinian conflict was conspicuously absent. In fact this was part of the protest movement’s self-conception as being “apolitical”. With the ebbing of the 2011 protest movement, activism for social justice is again done in smaller groups but a more militant minority. We are certain, though, that the protest movement will wake again, and are hopeful that this will happen sooner rather than later. 3) How is the work between the Israelis and the Palestinians in your group? Do religious or cultural differences play a role? Currently all members of our group are “Israelis”. They come, however, from various walks of life. At first all “Unity” members were Russian speakers who immigrated to Israel. Our focus then was to open the organization for members of different backgrounds to join, and to avoid being stuck in the Russian-speaking niche fringes in Israel. We have successfully achieved that and now our native Hebrew speakers far outweigh our Russian speaking members. Our next step is to be joined by Palestinian anarchists and other groups in Israeli society. We have a number of Palestinian supporters, both in the region and abroad and we are working to strengthen our relations with Arab anarchists in the Middle East, in occupied Palestine as well as other countries in the region. In the common struggles against the occupation, religious and cultural differences sometimes have an effect. Activists try to respect the cultural and religious differences they might have with populations they are in solidarity with. However, the common struggles creates mutual understanding as well as lasting friendship among activists from different backgrounds. 4) Tell us about the history of the anarchist movement in the region. The Jewish anarchism was always somehow linked to the Zionist question. How is it now, 65 years after the grounding of the Israeli state? The history of the anarchism in the region is relatively understudied, and a lot remains to be determined. As in many other places, in the Middle East anarchist ideas seems to have been introduced first by radical European immigrants. In Palestine specifically, waves of Jewish immigration from Europe brought with them socialist and anarchist ideologues, among others, who saw no contradiction between their Zionist vision and their communalist, semi-anarchist aspirations. Zionism sparked a debate in the international anarchist movement and especially among Jewish anarchists. However, many anarchists who are often said to have been supportive, or soft on Zionism, had in reality a more complex vision. French anarchist Bernard Lazare, who had strong ties with the Zionist movement, was never a Zionist in the same sense as the Zionist Organization. In the end Lazare broke with the Zionist movement seeing that the Zionism of people like Theodor Herzl was thoroughly bourgeois and incompatible with his class-struggle anarchism. Emma Goldman is known for a soft position on Zionism, but in fact, although she was sympathetic to the plight of the Jewish immigrants who seeked asylum from Pogroms in Palestine, and did not want to prohibit their immigration, she was thoroughly against Zionism which she saw as “the dream of capitalist Jewry” over the world. Anarchism influenced parts of the Kibbutz movement – the ‘socialist’ part of the Zionist movement that attempted to set up agrarian semi-industrial communes, or Kibbutzim, for Jewish immigrants in Palestine – but the extent of this influence is understudied. Kropotkin and some Jewish anarchists, such as Gustav Landauer, were highly regarded by parts of the Kibbutz movement. Kropotkin’s books were some of the first to be translated into the renewed Hebrew language and were widely read. During the Spanish Civil War, there was a great interest in the Kibbutzim in the Spanish anarchist movement, and some anarchists from within the Kibbutz movement traveled to Spain to fight in the militias. There is even partial evidence of an attempt to establish a local section of the IWA, but the details or the outcome are unknown to us. A second anarchist current was the Yiddish speaking anarchist community in Israel, many of its members having taken part in the anarchist movements in eastern Europe. Members of this second wave were not part of the Zionist movement. They were victims of Nazism who found refuge in Israel immediately before or after its proclamation. This Yiddish speaking anarchist community was prolific, and published many books on anarchism as well as a regular journal, “Problemen”, edited by Abba Gordin and Yosef Ludin. At first “Problemen” was bi-lingual, published in Yiddish and Hebrew. Soon it stopped publishing in Hebrew, and was written in Yiddish only, a language which at that time many if not most Israelis did not understand. When it stopped publication in 1989 it was the last Yiddish anarchist publication in the world. As Yiddish was being gradually erased from the public sphere, its place being taken more and more by modern Hebrew, and as these old comrades died one by one and their publications stopped seeing light, this current of anarchism ceased to exist. Yiddish anarchists in Israel appear to have had ambivalent approaches towards the state of Israel. On the one hand they stood against Israel’s policies directed at the Palestinian, yet they recognized a need to defend Israel at present until anarchy can be a viable option for the region (they rejected the unilateral dismantling of the state of Israel as unanarchistic, in that it will simply allow neighboring states to conquer the area). Some even accepted elements of Jewish mysticism and nationalism. One of the characteristics of the ‘new anarchism’ in Palestine-Israel, which developed in the last 20 years or so, is its far more radical and decisive opposition to Zionism and the occupation. This wave does not have its roots in the Zionist labor movement or in the radical Jewish activity of past ages in Europe and the heritage of Yiddish anarchism. Now-a-days many anarchists are full-fledged anti-Zionists and active in solidarity campaigns against the Apartheid wall, against the dispossession of Palestinians, the building of settlements and other struggles. Virtually all anarchists are opposed to the Israeli occupation, even if definitions of the scope of the occupation differ. Following the Arab Spring, many Arab anarchist activists in the Middle East began organizing together, and anarchist initiatives sprang out all over the Middle East. Anarchism’s place among radical Palestinians appears to be on the rise, as well. 5) And historical stuff once again: do you know what happened to the Israeli Black Panther movement of Arabs and Mizrahim? The Black Panther movement in Israel was a protest movement of Mizrahim (Oriental Jews, mostly from Islamic countries) that started in the Musrara neighbourhood in Jerusalem in 1971. The activists were mostly second-generation to immigrants from the Orient who felt discriminated by the ruling Labor Party (previously Mapai), which mostly represented the European Ashkenazi Jews. The movement held demonstrations, some of which were violent and clashed with police forces, and direct actions. In one of their most renowned direct actions, known as “Project Milk”, Blank Panther activists expropriated bottles of milk from the doorsteps of residents of the rich Rekhavia neighbourhood in Jerusalem, with a mostly Ashkenazi population, and distributed them to poorer families. Connections were formed between the Black Panther movement and radical Israeli political parties, as well as Palestinian movements. Black Panther activists met with PLO representatives and were condemned in Israel for that. In the end of 1973, after the war ended, the movement stood for elections as a political party, and was close to passing the votes threshold but was not able to get a parliamentary seat. In the 1977 elections some of the central activists joined leftist parties and became parliament members for some years, but the movement as it was disintegrated. Today, some of the old-timers are still active. For example, one of the central activists in the Black Panther movement recently announced that if African asylum seekers are thrown in jail, he will join them there. (About 50,000 African asylum seekers reached Israel from Sudan, Eritrea and other African countries. They are jailed, many are legally unable to work for a living, and their requests for asylum not even checked by the Israeli authorities). The legacy of the Black Panthers lives on and inspires Mizrahi activists. For example, the name of a grassroots organization of community and neighborhood activists called “The Not-Nice” is inspired by a famous saying by Golda Meir, prime minister of Israel during the height of the Black Panther movement’s activity, who supposedly said of the Black Panther activists that “they are not nice”. 6) Could you tell us about the actual anarchist press and media? Are there some newspapers, zines, radio stations may be, or do such things take place on the Internet meanwhile? 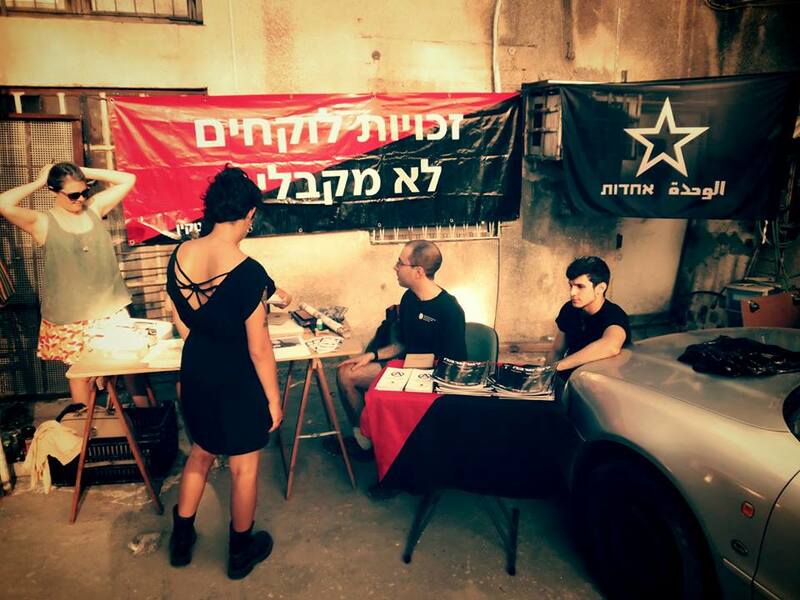 Anarchist press and media in Israel are not as established and developed as they are in Europe. In the past numerous radical fanzines circulated, many of them influenced by punk culture. These fanzines often expressed anarchist and radical ideas. While they still exist, with the spreading of the Internet fanzines have become less widespread and online sources gradually replaced them. For example, “It’s All Lies”, a fanzine published during 1991-1993, is now an Internet website publishing anarchist media items and a critical and cynical view of current events. The role of the Internet and social media for the dissemination of anarchist ideas, and organizing among anarchists, is becoming more and more important. Our organization publishes an anarchist magazine called “Alternative”, of which 6 issues have been published so far. A new issue is published every few months. With each additional issue more content is added and more copies are printed. I’m not aware of other regular anarchist publications in print. 7) One reads periodically, that young people in Israel have troubles refusing the military service, as one of your members did newly. Is the army a big problem for the anarchist movement? Do you think it’s no longer necessary to protect the Jewish state? There’s a law drafting 18 year olds into military service. However there are many ways to dodge the draft, even though it is mandatory according to Israeli law. In recent years there has been an increase in the number of 18 year olds dodging their military draft, with the most recent statistics stating that about 25% of the boys and roughly 45% of girls required to draft, dodge the draft in various ways. However, most of those who dodge the draft do not do so out of disagreement with Israel’s policies towards the Palestinians. A large percentage of boys that avoided their draft are Ultra Orthodox, whose religious beliefs are that studying Torah is more important than serving in the army. Many others do so because they see the army as an oppressive system – not necessarily towards Palestinians but towards them, the draftees. There are many ways to dodge the draft, many include lying to the army about health and mental conditions or about religious beliefs. In addition to those who dodge the draft on various grounds, there are people who openly refuse to serve in the army out of ideological reasons. These refuseniks are openly stating their ideological reasons and know that they will be not be able to evade the draft easily, but will have to endure military prison again and again until either they give up and accept the draft, or the military gives up and releases them. In 2003 a famous trial of five leftist refuseniks took place. The court found them guilty and they were incarcerated in a civilian prison. Every year or so some draftees publicly refuse to serve out of ideological reasons and are sent to prison. During the disengagement plan from the Gaza strip, some in the right began calling for refusal to serve in the military that abandoned their settlement in the Gaza strip. However right wing refusal never took root, and while occasionally right wing soldiers refuse an order they object to, refusal to serve in the army as a whole is seen as leftist. As anarchists, we do not see it as our goal to defend the Jewish state, or any other state. Surely the population of the region, both Jewish and Arab, needs defense from whoever might threaten them. Yet the Israeli army and government do not really protect even the Jewish population. The deepening of the occupation and the ongoing oppression of Palestinians creates a vicious circle and produces violent resistance which threatens the Jewish population. There can be no true security for the Jewish population without peace and without the end of the occupation, since the existence of the occupation continually produces violent resistance. 8) Regarding the State of Israel: So you are tending toward the one-state solution in the medium tern, like Uri Gordon (in the “Anarchy Alive”) does, for instance? We don’t have a collective approach on the question of medium term statist solutions for the Israeli-Palestinian conflict. To me, it seems that the return of the refugees and the opening of the geographic space (dismantling the apartheid wall, security checks and barriers) must be the cornerstones of every proposed solution. The Zionist state will never willingly dismantle itself or allow itself to cease being Zionist or to have a non-Jewish majority. It can only be overthrown by a popular movement of Palestinians (and hopefully Jewish supporters) and outside pressures. The idea of a one-state solution goes against the core of Zionism, and therefore we can expect extreme resistance to it by Israel. If the very core of Zionism is being challenged, why should it be done for the sake of establishing a new state? Obviously, various statist solution are not one and the same, and each of them have relative faults and merits. But I see no need to advocate for a solution that is neither a realistic option for the near future nor in accordance with anarchist principles and practice. 9) Did your heard about such German “movements” like anti-germans and anti-imperialists? If so what do you think of such positions toward the Israeli state and the the conflicts in the so called Meddle East? What do you think about such actions like the Gaza flotilla raid/Mavi Maramara 2010? Some of us have heard of the “anti-Deutsche” movement in Germany. While we don’t have a collective position on them, their conduct and premise appear to stand in contradiction to our ideas as we are firmly opposed to the occupation of the Palestinians. The anti-Deutsche positions on the Israeli-Palestinian conflict appear to be no more than a whitewash of Israeli crimes. We refuse to equate anti-Zionism with anti-Semitism. The “anti-Deutsche” draw the wrong conclusions from the history of anti-Semitism in Germany. Instead of resisting systems of oppression and racism wherever they appear, this history leads them to whitewash Israeli crimes and the oppression of Palestinians. Thus the “anti-Deutsche” appear as a reactionary movement. We support solidarity with the Palestinian population. As anarchists we are especially fond of resistance and solidarity that take the form of direct action. While we don’t know the exact motives of the organizers of the Gaza flotilla, and I doubt that their political vision is similar to ours, this does not matter. Naturally we denounce all forms of oppression by the Israeli army on the Palestinian population, including the raid on the Gaza flotilla. 10) Well, I must remark you misunderstand the “Anti-Germans” somehow. It is the consequent reaction on the defeat of the Revolution in Europe and on complicity of the European left on this defeat. The foundation of the Israeli state was for them – let me say it that way – the last act of the (bourgeois) Revolution. (But it’s not about telling Israelis what to do. ;)) What would be then the right conclusion from the history of the anti-Semitism in Germany in your opinion? In a nutshell, the need for universal condemnation of, and resistance to, racism and fascism in whichever form they might appear. 11) Regarding the 2011 protest movement: what were the causes for the decline of the movement? What happened since then? I’ve heard about the success of Histadrut union, but it seems like the organizing in the crisis is a difficult thing in Israel too. Would you tell a bit more about the economical situation of the population in the region? One of the causes of the decline of the 2011 protest movement was its inability to move beyond mere demonstrations and symbolic actions (like the smashing of bank glasses, controversial in the protest movement) to actual immediate gains, through direct action or otherwise. In response to the protest movement a committee was set up by the government in August 2011 to “find solutions to socio-economic problems in Israel”. The committee’s report and government decisions to implement (some of) it, threw some bones to the protest movement in the form of very minor reforms. While the protests continued and even increased after the report was published, it was not effectively challenged by the protest movement, which was comprised of many different actors some of which want wholly different things. The momentum slowly ebbed and the protests declined. In the summer of 2012 the protests were resurrected in a much smaller form. Eventually the movement was co-opted into parliament when self-appointed “leaders” of the movement joined the Labour Party and became opposition MPs after the elections were over. Since then it is mostly the small core of activists that keep the protest going. These are mostly neighbourhood and community activists, single mothers, public housing activists and others. However, the protests they organized, despite tending to be more radical and critical of parliamentary politics than their predecessors, are small and often not reported in the mainstream media. Recent cuts to social security and a raise in taxes did not (yet) provoke a noticeable awakening in the protest movement. But the rest remains to be seen. Since the 2011 protest was a summer protest Israeli activists often look forward to the next summer, hoping it prove to be a summer of protest. We shall what the summer of 2014 will be like. The Histadrut union is the biggest union in Israel. It was established in 1920 as an important organ of the Zionist movement and had close ties with the labour government. The Histadrut had an important part in the Zionist project, specifically in promoting the “(Jewish) conquest of labour” in the area to exclude Arab workers. It did not unionize Arab workers, in fact only in 1959 did it decide to let Arab workers join (under Zionist supervision, of course). As Zionist labour leader Tabenkin put it, its role was not to unionize all workers, including Arabs, but to lead the way towards a Jewish state. Despite common interests between Jewish and Arab workers under the British mandate, the Histadrut served to split the working class between Jews and Arabs. After the foundation of the Israeli state, it supported the martial law imposed on Arabs inside Israel from 1948 to 1966. Initially the Histadrut was not only a (Jewish) labour union but also a big employer. The Histadrut owned and operated many enterprises. This changed when it was reconstituted in 1994 as the “new Histadrut”. Many of its enterprises were privatised, and its role changed. It was becoming less and less a key instrument for Zionist policy, and more of a tool for class collaborationism and compromise between the workers and the rising industrialists. The Histadrut slowly stopped all efforts to unionize workers, and the number of workers who are part of a union gradually declined from the 80s onwards. While in the 80s about 85% of Israeli workers were either directly unionized or included in collective agreements negotiated by the unions, the number dropped and stood in the first decade of the 21st century at about 35%.This was in part due to government policy which was turning more and more pro-laissez faire, a rapid increase in the number of temporary workers employed through employment agencies, and in part due to the unwillingness of the Histadrut to do anything about it. In recent years, in the wake of the 2011 protest movement, the Histadrut’s stance was somewhat challenged by new alternative unions, specifically Koa’ch La’ovdim (Power to the Workers), who unionized many new workers and snatched some out of the hands of the Histadrut. This competition triggered a slight change of direction in the Histadrut. Unfortunately, despite a rapid increase of 60% in the number of newly unionized workers in 2013, the Histadrut remains steadfastly class collaborationist and Power to the Workers is slowly becoming more and more like the Histadrut. 12) Regarding the so called Arab Spring again: could you tell more about those new anarchist connections in the region? On the other hand, the antisemitism is still very virulent in Arab societies, it’s what holds and mobilizes the Arab nations since decades. Reactionary forces reshape themselves too, are you aware of it, how do you see it? In the wake of the Arab Spring, anarchist groupings appeared throughout the Middle East, in Egypt, Lebanon, Tunisia, Syria and other places. We got in touch through E-mail and social media with activists in these groupings, especially the Libertarian Socialist Movement in Egypt. It was somewhat surprising for us that these groups mostly didn’t fear being associated with us, despite virulent anti-Semitism in their countries and the fact that connection to “Israeli” anarchists could be used against them by the establishment and others who try to persecute them. We exchanged ideas and analyses and built comradely relations. We were invited to a Middle Eastern anarchist conference, supposed to take place in Tunisia, which was unfortunately postponed. It is true that anti-Semitism is rampant in Arab societies. In some places anti-Semitism and anti-Zionism are confused and blended together. This is partly a consequence of the identification of Israel as a Jewish state, which uses Jewish symbols officially, and binds together Judaism and Zionism. I think however that it is exaggerated to say that anti-Semitism is what holds and mobilizes Arab nations since decades. Arab countries created complex ideologies and national identities to preserve their rule. Anti-Semitism is only a part of that. After the Arab Spring many in the Arab world are realizing that the Palestinian struggle was used as a fig leaf by their repressive regimes, and anti-Semitism is part of that. It’s a diversion. The best thing we can to dispel the heavy fog of anti-Semitism in Arab countries is to show Arab activists that there are Jewish activists opposing the occupation in Palestine and opposing foreign intervention and imperialisms in the region. 13) I’ve read you are participating on some self-management projects somewhere in the North of the country. A very interesting thing, could you tell us more about it? In 2012 one of our activists worked in a bread factory in Nazareth, in the north of Israel, which employed mostly Arabs and Russian immigrants from low socio-economic statuses. The workers organized daily “worker classes” after work, in which they discussed capitalism, exploitation, etc. After 3 months, when the employer found out about it, the activist was fired. Another one of our activists is involved in a self-management project of a different kind in the north. He is involved in the operation of “Cafe Hevruta” (Friendship Cafe), a co-operative coffeeshop n the periphery city of Qiryat Shmonah, which houses many radical events.